I have been blogging since 2011. 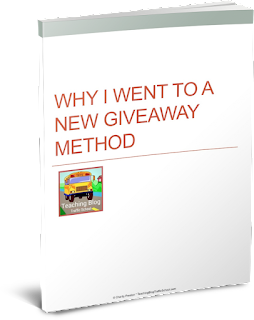 I have hosted easily 75+ giveaways – probably closer to 100. Some of the giveaways were cross-promotions with other TpT sellers. Others were sponsored by educational product companies such as Learning Resources or Educational Insights. I have worked with amazing famous children’s book authors – with many of them even signing the books for the giveaways! Products have ranged from calculators, lots of classroom games, tons of books, digital microscopes, pedometers, shoes and apparel for teachers, dry erase boards, pencil sharpeners, tablets, cutting machines, and even a super large classroom rug! Needless to say – being a teacher blogger that works with companies for reviews has its perks when you also get a matching preview copy to review! Why do I continue doing it? Knowing how much teachers spend on materials in their own classrooms, I was determined to get as many free products into the hands of those teachers as possible. And soliciting companies for reviews was a surefire win-win-win for us all. Are you a blogger? Want to get even more details about how my latest giveaway went? Download the 9-page handout which share all the details HERE.